It’s been 6 weeks since my husband, two boys and I left Paris and made a new home in Hong Kong. This weekend I saw a Facebook post from an ex-colleague who was visiting Paris and she’d attached a funny image of a quintessentially French moment – a baguette neatly tucked into a briefcase after the ‘statutory’ visit to the local boulangerie. This photo, and its Parisian symbolism made me nostalgic for the city we’ve called ‘home’ for the last three years, flooding my head with many fun, amazing, colourful and romantic memories and knowing that we’ll always have Paris. The thing about this life is that nothing is permanent and change is inevitable in one form or another, the Buddhist notion of impermanence reminds me that, without exception, everything we know in this world is transient and all we can do to make it last longer is to stay as present, in this moment, as possible to soak up each and every minute – and that includes eating as much baguette and pastries when in Paris as possible! Today, I thought I’d indulge in my wistfulness for the beautiful city of Paris and the amazing three years I had there by listing my favourite things to do in Paris. 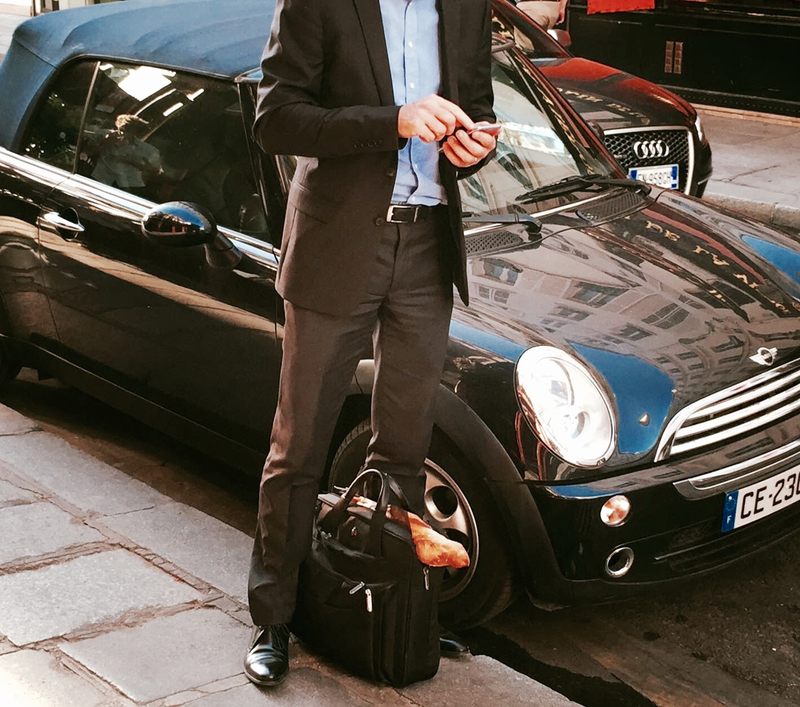 So here it is … a few of the real, everyday things I did while living as a Parisian. Favourite place to enjoy a crepe: There is a little café, with red bistro-style tables and chairs in the Champs de Mars (I wouldn’t be able to tell you the name as I’ve never taken notice of it), but right alongside it stands a manual merry-go-round that kids go crazy for and it’s over a century old. There are also two children’s playgrounds right behind the crêpe stand and right in front of you stands the great Eiffel Tower in all her glory. I’ve spent many days with my kids and some of my best friends in all seasons enjoying a crêpe, hot coffee or ice cream. Walking along the Seine: Seems like an obvious thing to do right? But in fact, there is so much to do in the city of lights that sometimes this simple (and free) activity gets passed over for the grander museums and monuments. I love the walk along the pedestrianised Les Berges (starting at Pont de l’Alma) and it is by far one of my favourite things to do in Paris! It’s an easy promenade with lots to see as you pass under some of the most famous bridges of the city. You can participate in yoga classes, pilates, TRX training, skate boarding, wall climbing (more for the kids!) or cardioboxing and there are also sparkling mineral water fountains along the way to fill up your water bottle – no jokes! OR, if you’re more like me you can simply enjoy the food and a glass of wine from some of the cute café’s flanking the path. I especially love Rosa Bonheur, a hard-moored peniche which allows you to enjoy the gentle bobbing of the Seine while sipping on your sunset aperitif. Best gardens and park: Having small kids means always trying to find outdoor space and there are many great parks in Paris, but my heart belongs to the Jardin de Luxembourg. The original Palace gardens designed in 1612 by Mary de Medici, the wife of King Henry IV of France. Nowdays the French Senat owns the gardens and they meet in the former Palace. Its many designed common areas mean you can find a quite spot on a bench or a boisterous children’s playground. Patches of grass to picnic and tree-lined promenades; fountains and strikingly manicured flowerbeds make this space extremely beautiful. The huge kid’s playground is fenced in and appropriate for all ages, and in summer the sand pits are emptied and filled with water so kids can enjoy a paddle while in the park – super cool! Jewellery shopping: Who doesn’t like shopping?! One of my favourite quartiers and a firm Parisian favourite is the Marais, probably the fact the shops are open on Sundays has a little to do its favourite status. 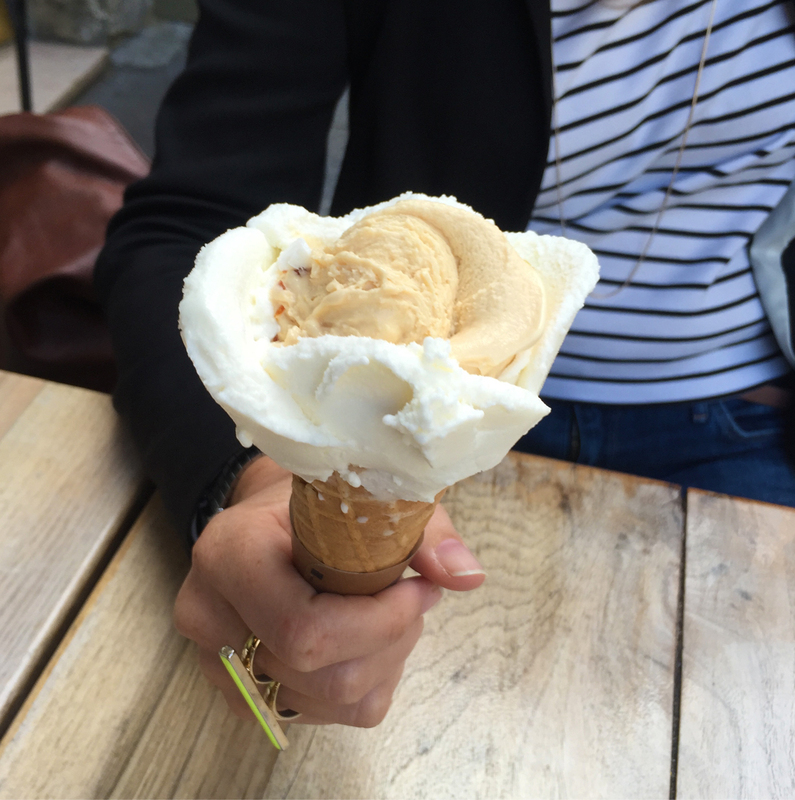 The area, especially around Places des Vosges, makes for a very lively, fun Sunday outing, and be sure to include some gelato from Amorino here too. I especially love all the smaller jewellery boutiques. A general stroll along Rue de Turenne, Rue des Francs Bougeois or Rue Vieille du Temple and you’ll be sure to bump into a few stores that will take your fancy, and I bet you won’t leave empty handed! Food, dessert and wine: France’s reputation for outstanding food is pretty obvious, but to relish it everyday and it be on your doorstep is a dream. Fresh food markets are still so much a part of Paris life, as is the baguette-run and morning croissant. Everywhere you look in the city there is food to find and I have never enjoyed cuisine as much as while living there – it always seems such a waste not to try the dessert du jour, non? I definitely miss the freshly baked whiff of the morning boulangerie, pain au chocolate with an “noisette”*, yes please! I miss the visual pleasure of the markets, the colours of the fruit, flowers, fish, cheese, nuts and delicious rotisserie chickens all juxtaposed. Every time I visited the markets (which you’ll find any day of the week all over paris), I’d leave with not a cent left in my wallet! There are so many good restaurants in Paris, even the smaller, more common brasserie with their traditional French (though limited menus) are good, you’d be challenged to find something that you don’t like – 0h, and you may as well ditch that diet! Riding the bus: I know this is a little obscure, (and most of my friends will agree to the fact that I know the buses real well) but one of my favourite things to so in Paris is ride the buses. It probably had more to do with the fact that the metro with small kids is completely impractical with it’s dozens of stairs making stroller usage impossible, but I also prefer being above ground. In a city like Paris where everywhere you go is like taking a museum tour, for less than 2 Euro you can see the city on a bus. My favourite routes you ask? 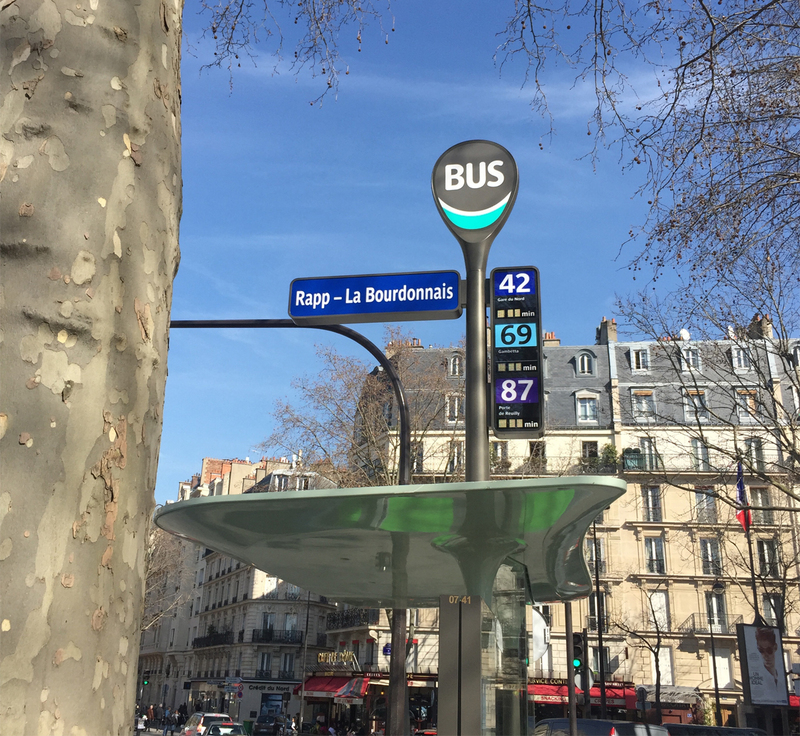 Bus 69 : Running from the Champs de Mars, through St Germain, over Pont Royal and along the Seine, past the Louvre to the Hotel de Ville, squeezing past the Marais around the Bastille and ending at the cimetiere du Pere Lachaise. If you take the bus in the opposite direction it takes you through the Louvre and you can admire the Pyramid. Bus 92 : From Montparnasse, Past the gold dome of Les Invalids, across the river at Pont de l’Alma (where you can gaze the Louvre) then all way and around the Arc de Triomph and into the busy district of the 17th. Thank you Sam! Going next month and taking your notes with me as I will have a few days on my own while Justin is working. Love your posts…although I have lived in paris for 10 years ..there is still so much I didn’t know…keep on posting…and by the way your pictures are fabulous…. Hi Anne, Thanks so much. I hope you’re having a gorgeous summer … I’m especially missing the tree lines streets today. Beautifully written-I feel nostalgic for you! How wonderful to have experienced this lifestyle-treasured moments for sure!